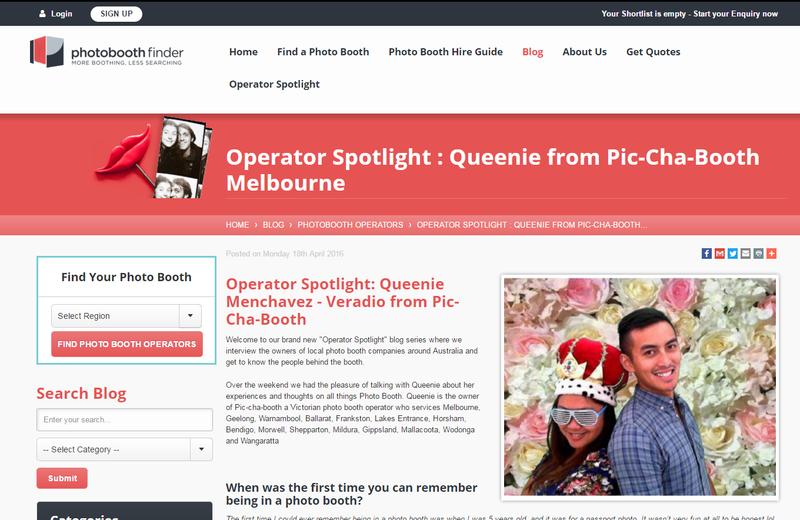 The Operator Spotlight is part of our ongoing commitment to helping drive more traffic, inquiries and bookings to our USA and Canada member photo booth operators. For our service users we are giving them valuable access to tap into and share our member operators unique experiences and insights into all things Photo Booth and learn about the people behind the booths. People are more likely to want to work with people who they feel they know even just a little bit so we are confident this promotion will be amazingly beneficial to both our member operators and our service users. Which, as the middle man, means we are doing our job in making truly valuable connections so everyone wins. The way it works is that we interview the owners or key personnel from a chosen member operator and post their interview on our blog and also promote their blog via Facebook and Twitter. Included in the blog will be a link back to the member operators The Photobooth Finder listing and a clear call to action to drive more inquiries. No. There is no cost involved in participating in our Operator Spotlight promotional blog. This is just one of the many benefits of being a valued member of The Photobooth Finder North American network. How long does the interview take? The interview only takes 15 - 20 minutes and we will fit in with you to make it happen. Aside from doing the interview you need to provide us with 4 good quality pictures of yourself ideally using or near your photo booths. We also ask that you link to your spotlight blog post on your own website, Facebook page and Twitter. You're also welcome to promote it via any other social media channels. The more you share in conjunction with our sharing across the same social media the more exposure for you. How do I get myself and my business featured on your next Operator Spotlight Blog? My photo booth business is not yet a Photobooth Finder member? Please REGISTER your business, complete your listing fully and start actively engaging with our users that inquire with you and enjoying all the benefits that come with being part of the Photobooth Finder network. Once you have done so you can send us an expression of interest to be featured on an upcoming operator spotlight blog. My Listing is not fully complete how can I fix it? Just LOGIN to your dashboard and use the editing functions in the top menu to modify your listings info and/or add more pictures to your gallery. Ive got other questions not answered here who can I ask? Please send an email to info@thephotoboothfinder.com and I will be glad to help you.